You are currently browsing the tag archive for the ‘Byron Janis’ tag. 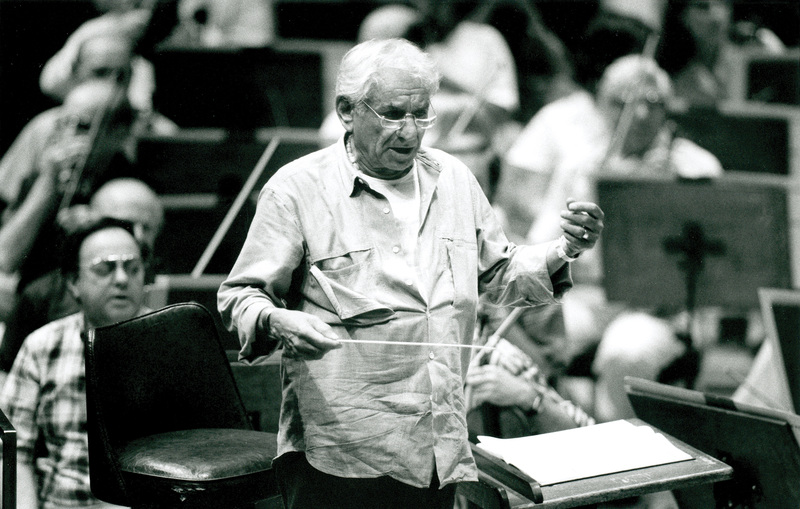 Bjaland, Fiore, and Tamarkin appeared in conjunction with the 1988 American Conductors Program for which Bernstein was the artistic advisor. A joint project of the American Symphony Orchestra League and the Chicago Symphony Orchestra, the program was made possible through the generous support of the Ford Motor Company Fund. 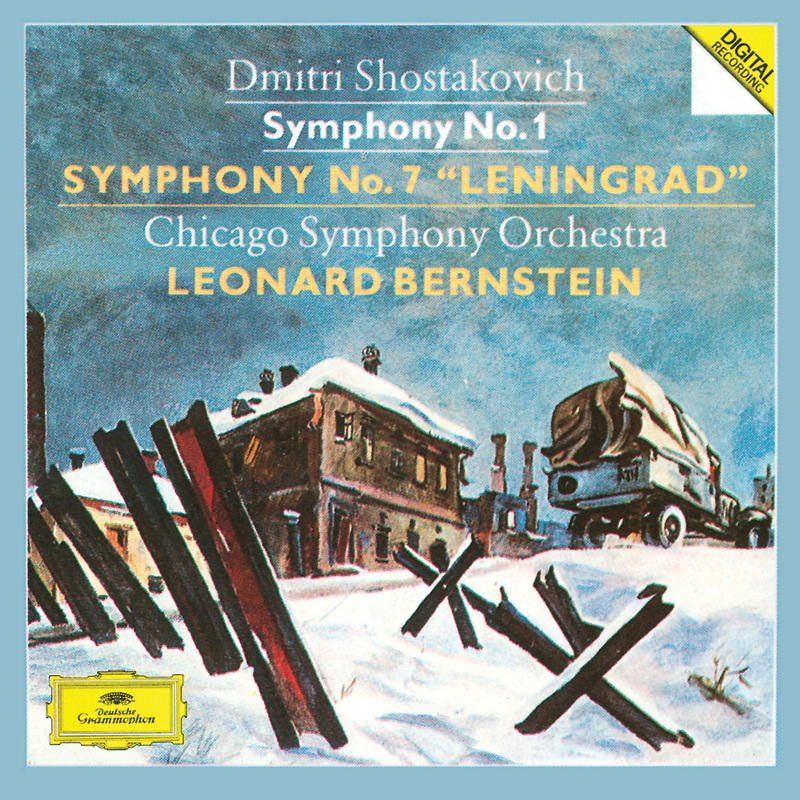 Both of Shostakovich’s symphonies were recorded live by Deutsche Grammophon and the subsequent release received the 1990 Grammy Award for Best Orchestral Performance. 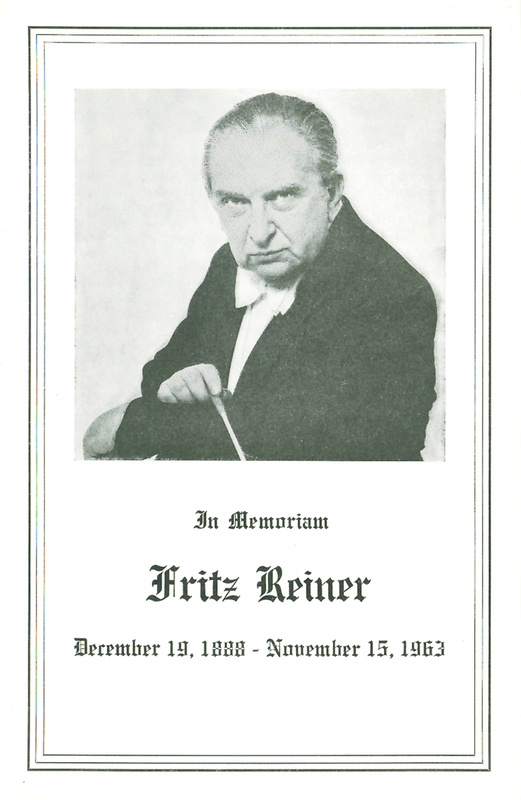 Fritz Reiner, the Chicago Symphony Orchestra’s sixth music director from 1953 until 1962 and musical adviser for the 1962–63 season, died in New York on November 15, 1963. 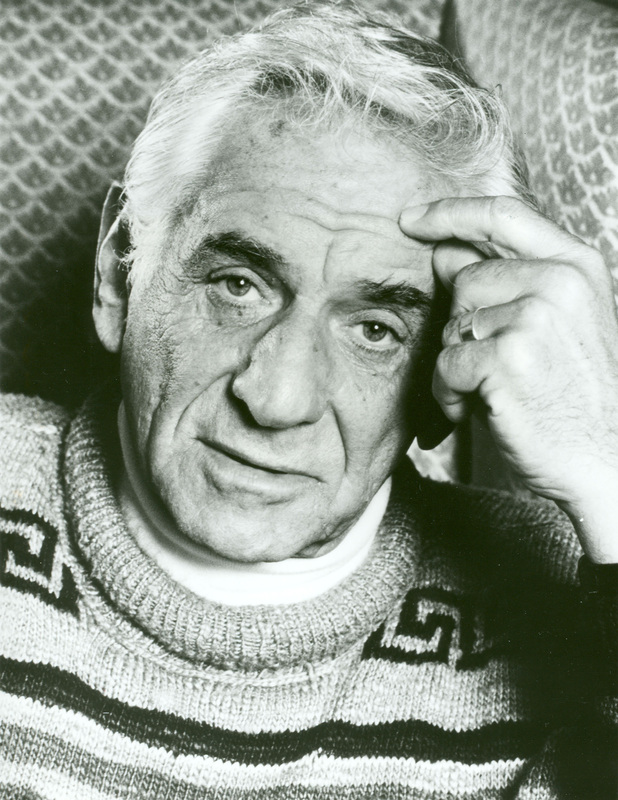 Jean Martinon had programmed the Thanksgiving week concerts (on Thursday evening and Friday afternoon, November 28 and 29) to include Stravinsky’s Symphony of Psalms and Mozart’s Requiem (Margaret Hillis and the Chicago Symphony Chorus had been rehearsing the two works since early September). These were designated as memorials to Reiner, and the program page for the November 21 and 22 concerts included an announcement. 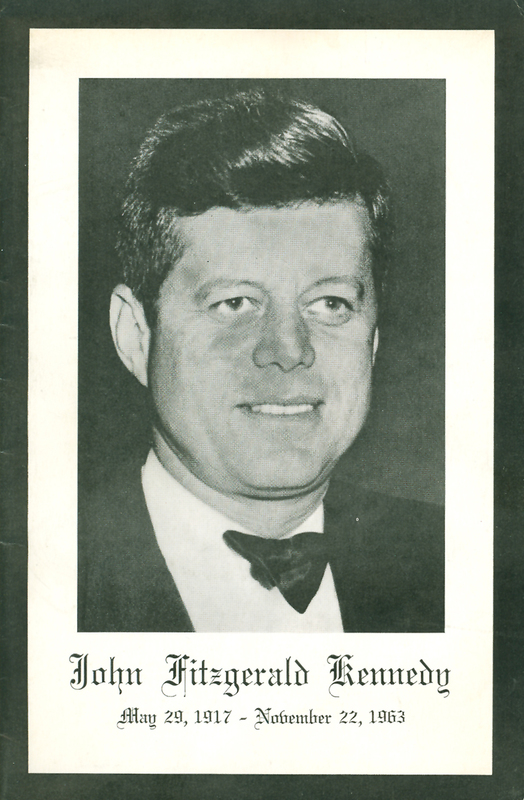 The November 22 CSO matinee concert was scheduled to begin at 2:00 p.m., not even two hours after President John F. Kennedy had been shot while riding in a motorcade in Dallas (Walter Cronkite confirmed the news of Kennedy’s death at 1:38 p.m.). Just before the concert began, an announcement was made from the stage (presumably by general manager Seymour Raven), and there was significant reaction of shock from the audience, including audible gasps, cries, and even screams. 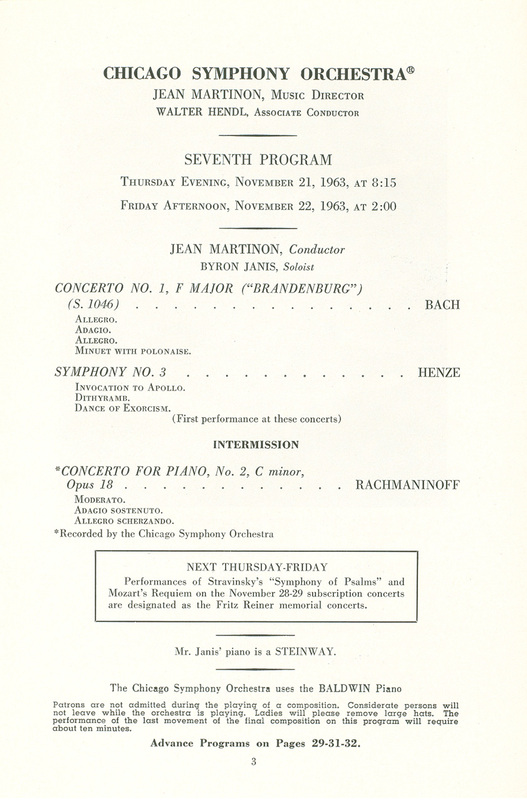 Moments before, it had been decided to open the concert with the second movement—the funeral march—from Beethoven’s Third Symphony (Eroica), followed by the rest of the program as scheduled: Bach’s First Brandenburg Concerto, Henze’s Third Symphony, and Rachmaninov’s Second Piano Concerto with Byron Janis, all led by Martinon. More information regarding the events of November 1963 can be found here and here. Congratulations to Seiji Ozawa—the Ravinia Festival‘s first music director from 1964 until 1968—who will be a recipient of this year’s Kennedy Center Honors! Additional honorees, announced today, include American rock band the Eagles, singer-songwriter Carole King, filmmaker George Lucas, actress and singer Rita Moreno, and actress Cicely Tyson. The gala event will be broadcast on CBS on December 29, 2015. 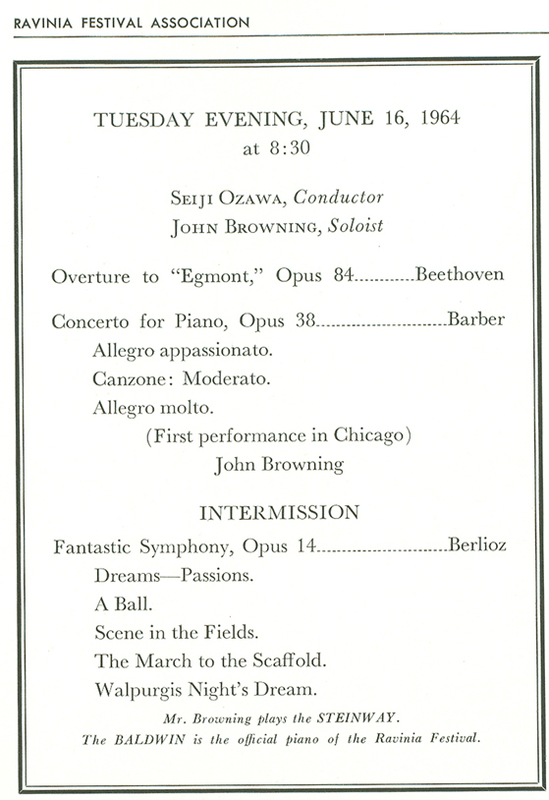 As a last-minute replacement for Georges Prêtre in July 1963, Seiji Ozawa was called upon to lead the Orchestra in two concerts at the Ravinia Festival. The twenty-seven-year-old conductor made his debut with the Chicago Symphony Orchestra on July 16, leading Beethoven’s Leonore Overture no. 3, Grieg’s Piano Concerto with Byron Janis, and Dvořák’s Ninth Symphony. 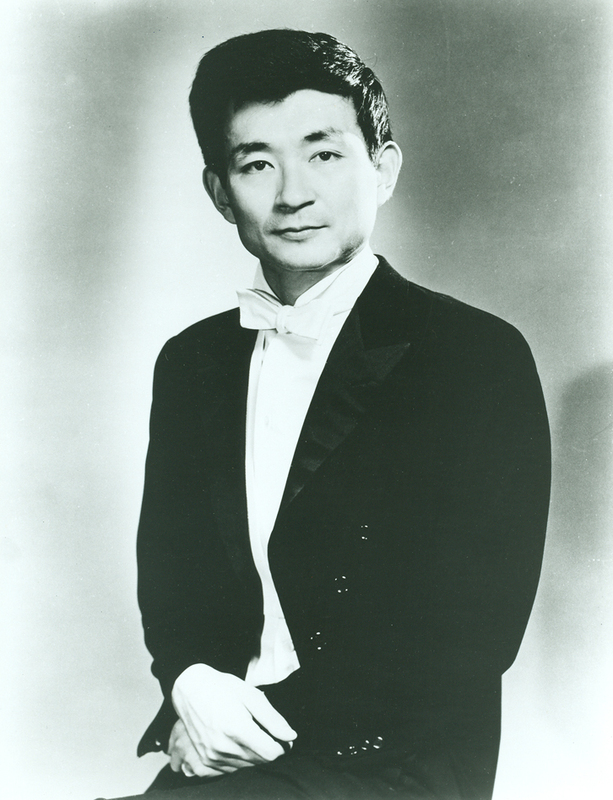 Thomas Willis in the Chicago Tribune reported that Ozawa was “instantly in command when in possession of a baton and a musical idea. His conducting technique reminds you of his teacher, Herbert von Karajan, in that it lays the score in the lap of the orchestra with transparency of gesture and human communication, then commands acceptance.” On July 18, he conducted Rossini’s Overture to The Barber of Seville, Tchaikovsky’s Violin Concerto with Christian Ferras, Debussy’s Prelude to The Afternoon of a Faun, Takemitsu’s Requiem for Strings, and selections from Prokofiev’s Romeo and Juliet. 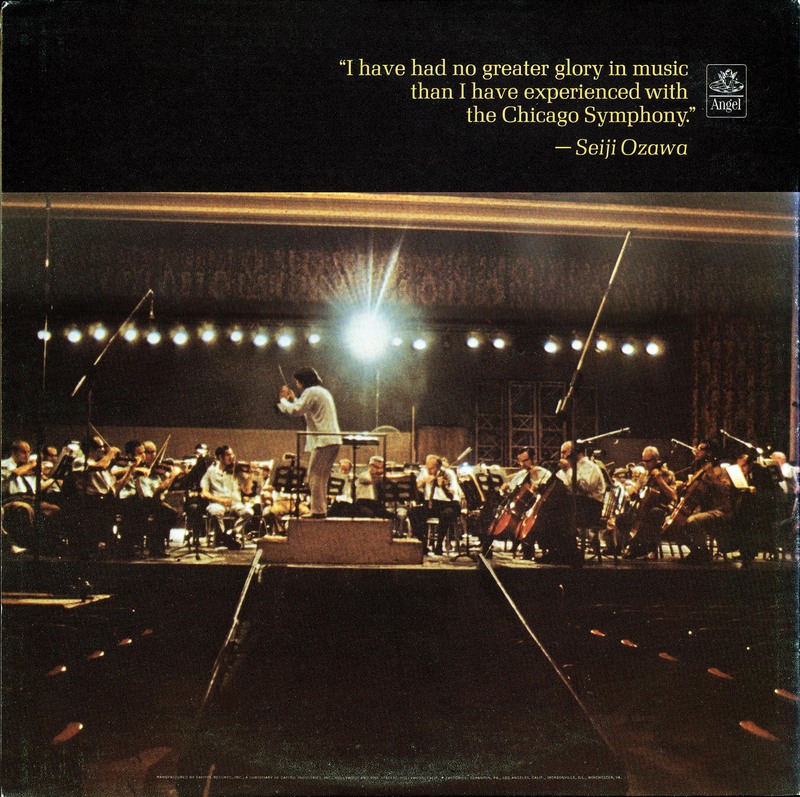 Between 1965 and 1970—both at Orchestra Hall and in Medinah Temple—Ozawa and the Orchestra recorded a number of works for both Angel and RCA, including Bartók’s First and Third piano concertos and Schoenberg’s Piano Concerto with Peter Serkin, Beethoven’s Fifth Symphony, Lutosławski’s Concerto for Orchestra, Ravel’s orchestration of Mussorgsky’s Pictures at an Exhibition, Rimsky-Korsakov’s Sheherazade with concertmaster Victor Aitay, Stravinsky’s The Rite of Spring, and Tchaikovsky’s Fifth Symphony, among numerous others. 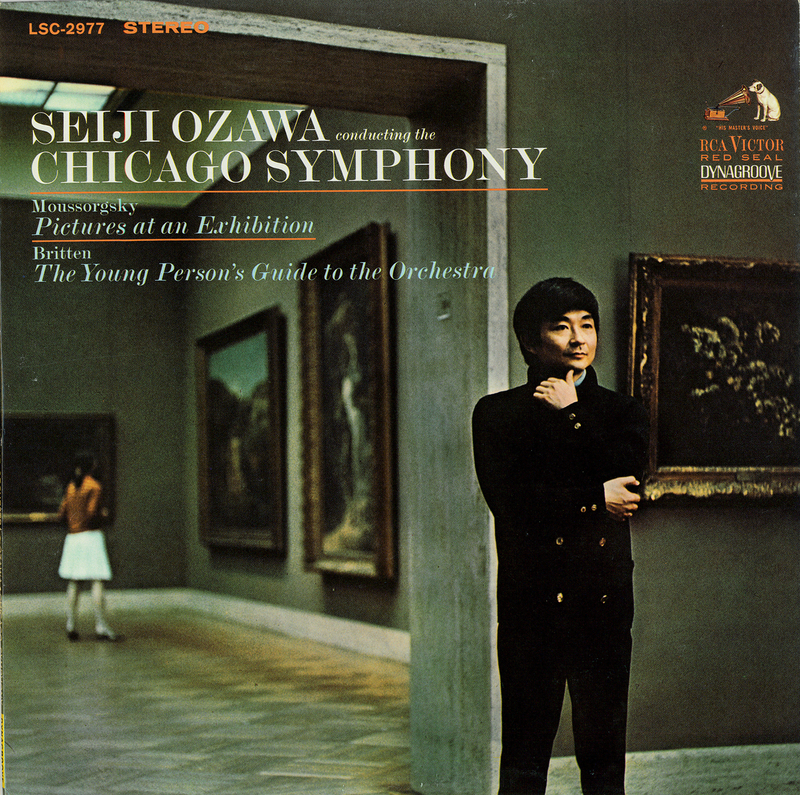 Ozawa most recently appeared in Chicago at Orchestra Hall on February 9, 1996, leading the Boston Symphony Orchestra, the Chicago Symphony Chorus (prepared by Duain Wolfe), Heidi Grant Murphy, and Michelle DeYoung in Mahler’s Second Symphony; and on January 10, 2001, conducting Mahler’s Ninth Symphony with the Saito Kinen Orchestra. November 22, 1963, already was a memorable day for Mary Sauer (currently the Orchestra’s principal keyboard), as it was her and her husband Richard’s fifth wedding anniversary. While on her way to Orchestra Hall for the Friday afternoon matinee concert, she heard the news of the events in Dallas: President John F. Kennedy had been shot at 12:30 p.m. CST while riding in a motorcade in Dealey Plaza. It was unconfirmed whether or not the president was still alive. 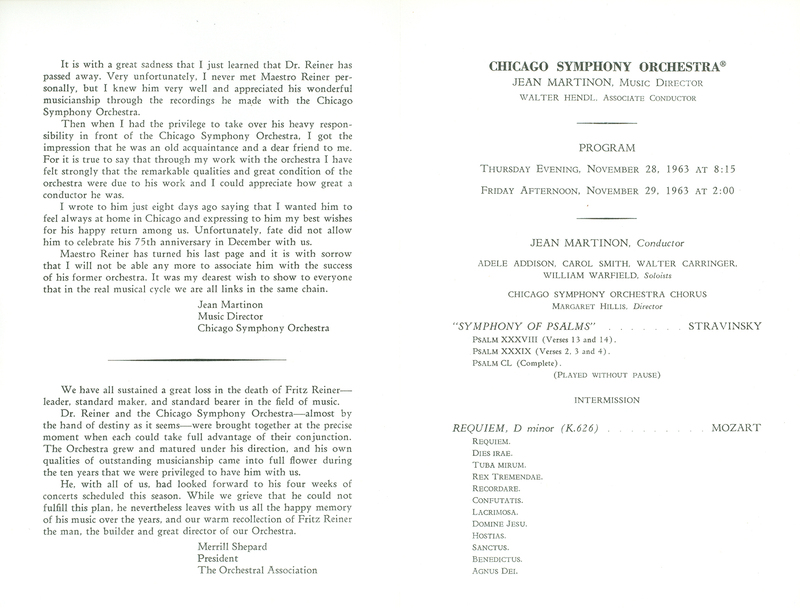 The CSO matinee concert was scheduled to begin at 2:00 p.m., not even two hours after the president had been shot and shortly after Walter Cronkite had confirmed the news of Kennedy’s death at 1:38 p.m. Just before the concert began, an announcement was made from the stage (presumably by general manager Seymour Raven) and there was significant reaction of shock from the audience, including audible gasps, cries, and even screams. 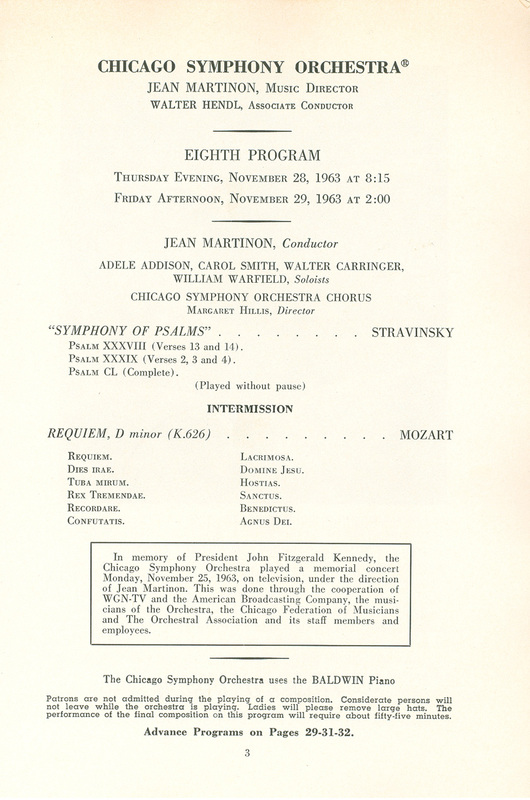 According to newspaper accounts, a “self-imposed blackout on all regular [entertainment] programs and commercials on television since President Kennedy’s assassination last Friday was brought to a close last night with special memorial programs.” The Chicago Symphony Orchestra made its own contribution on Monday, November 25, taping a concert for broadcast at 4:00 p.m. on WGN-TV. The program was carried by ABC in the afternoon and rebroadcast (presumably only locally) later that evening at 10:15 p.m. 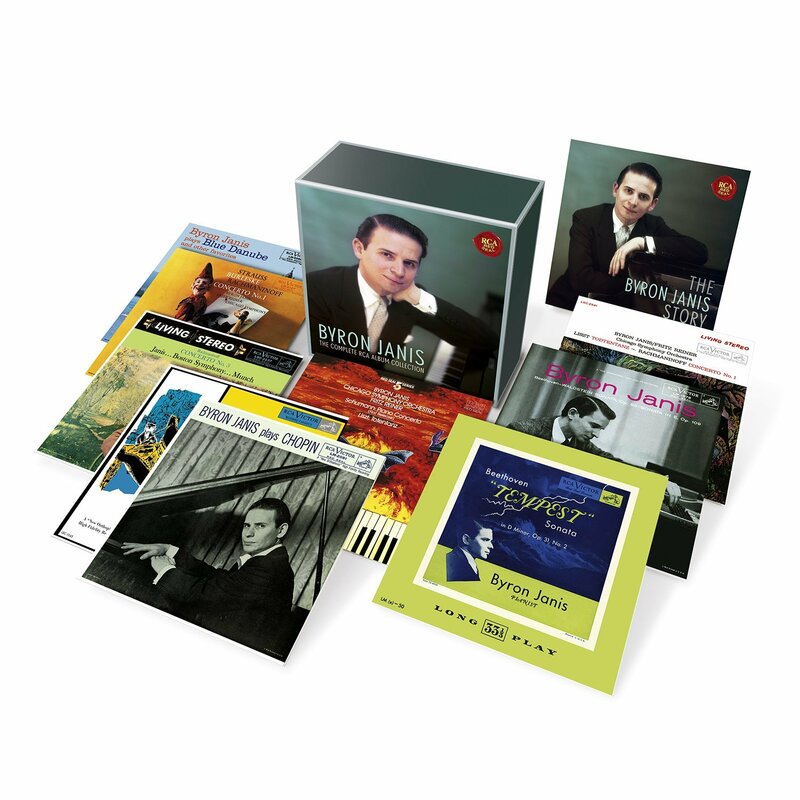 The television program contained works by Gluck, Bach, Beethoven, and Barber, all led by Martinon. The Bach was a repeat of the First Brandenburg Concerto from the previous week and the Barber was his Adagio for Strings. However, the other two works on the program remain unconfirmed, as no programs were printed and we do not have a copy of the broadcast in our collection. A logical choice for the Gluck might have been the Dance of the Blessed Spirits from Orfeo ed Euridice; but the Orchestra had just performed the Overture to Iphigénie en Aulide on November 14 and 15. Also, Martinon and the Orchestra had performed Beethoven’s Fifth Symphony on October 10 and 11 and the Seventh Symphony on November 14 and 15, so both interpretations would have been fresh. 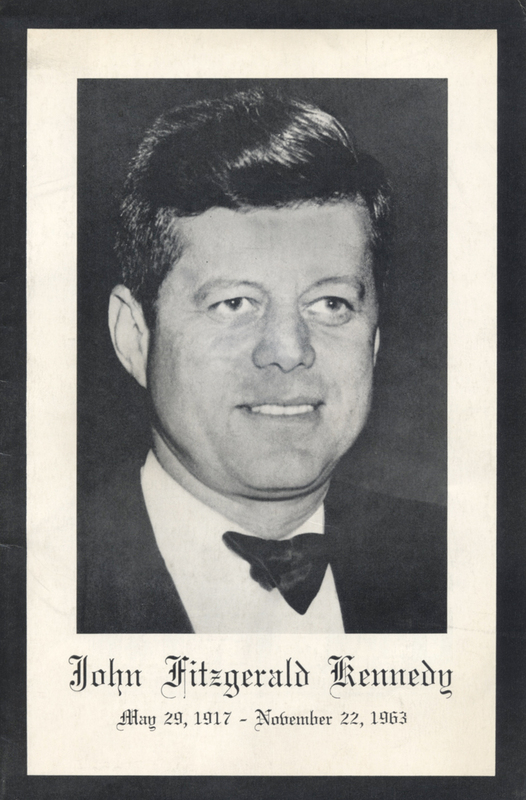 The subscription concert program for November 28 and 29, 1963—originally programmed by Jean Martinon months before and designated as a memorial to Fritz Reiner only days before—became a memorial for President John F. Kennedy. 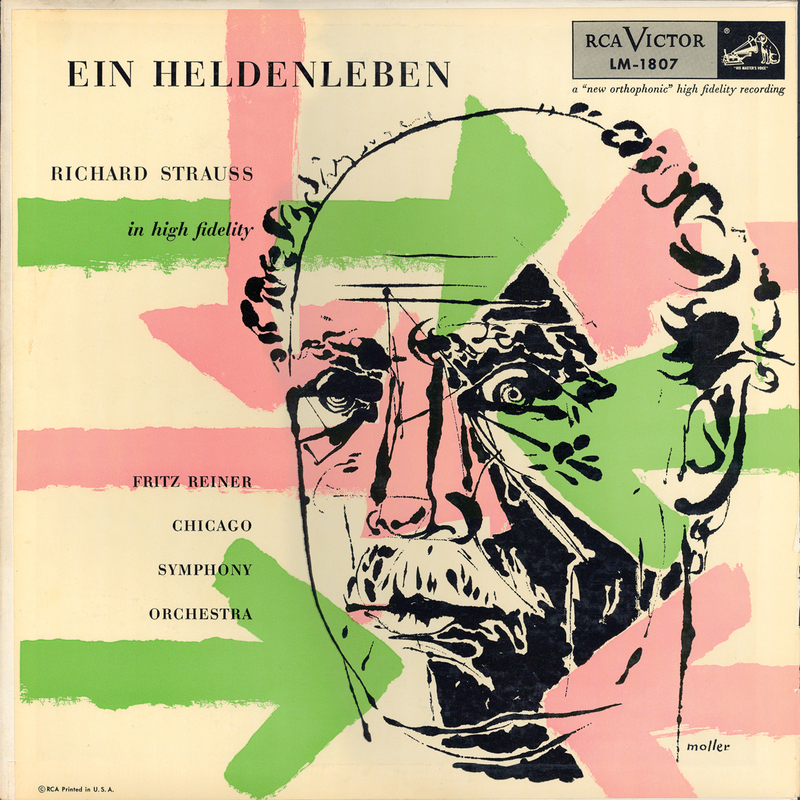 A new program cover was printed and the Reiner insert also was used. A footnote: at virtually the same time on Friday afternoon, November 22, 1963, a nearly identical scenario was unfolding in Kennedy’s home state of Massachusetts. The Boston Symphony Orchestra‘s Friday afternoon matinee began at 2:00 p.m. EST, and their concert already was in progress when orchestra management received word of the events in Dallas. Near the end of the first half of the program, music director Erich Leinsdorf was informed and the decision was made to play the second movement of Beethoven’s Eroica Symphony. 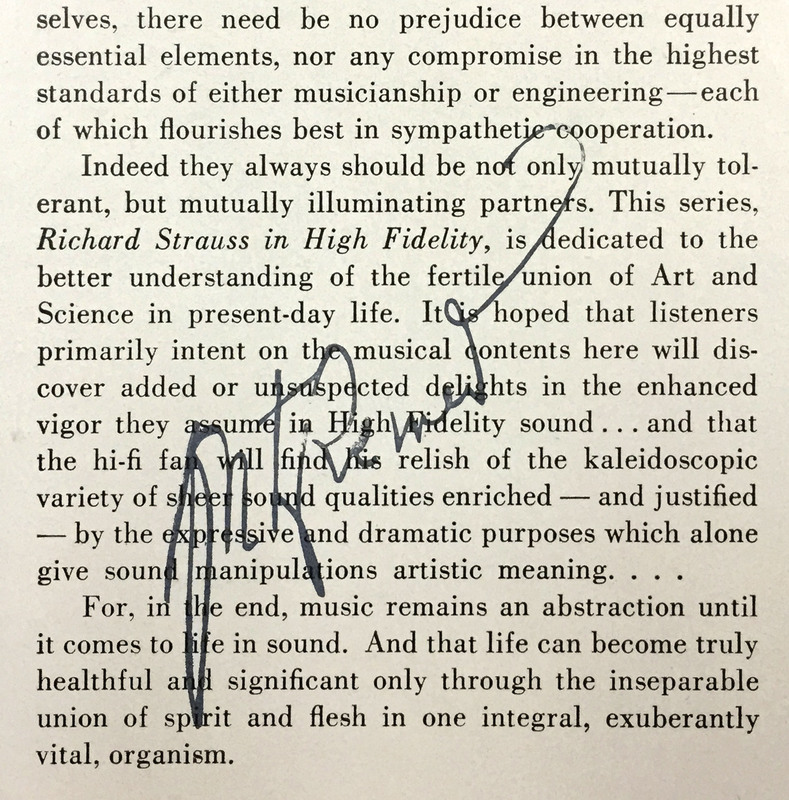 Their librarians (including William Shisler, whose recollection of the event is here) quickly distributed the music and Leinsdorf made an announcement from the stage. The entire event was captured on tape by WGBH and the audio can be heard here. 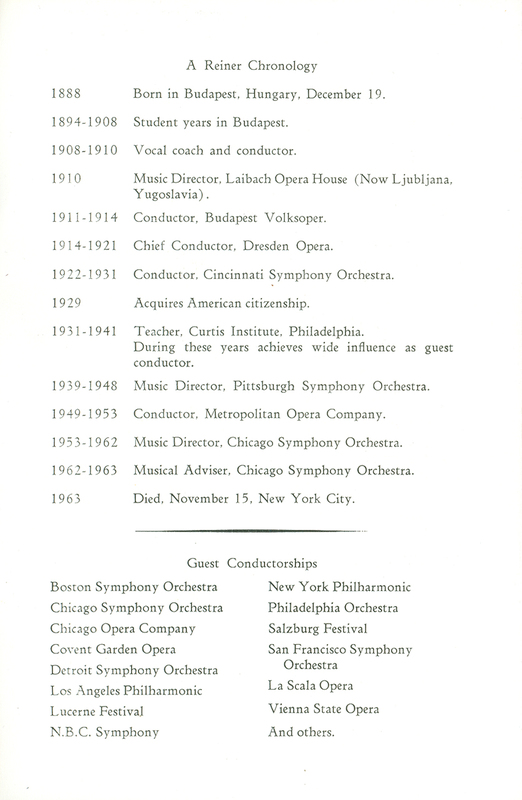 Thanks to Bridget Carr, archivist for the Boston Symphony Orchestra. 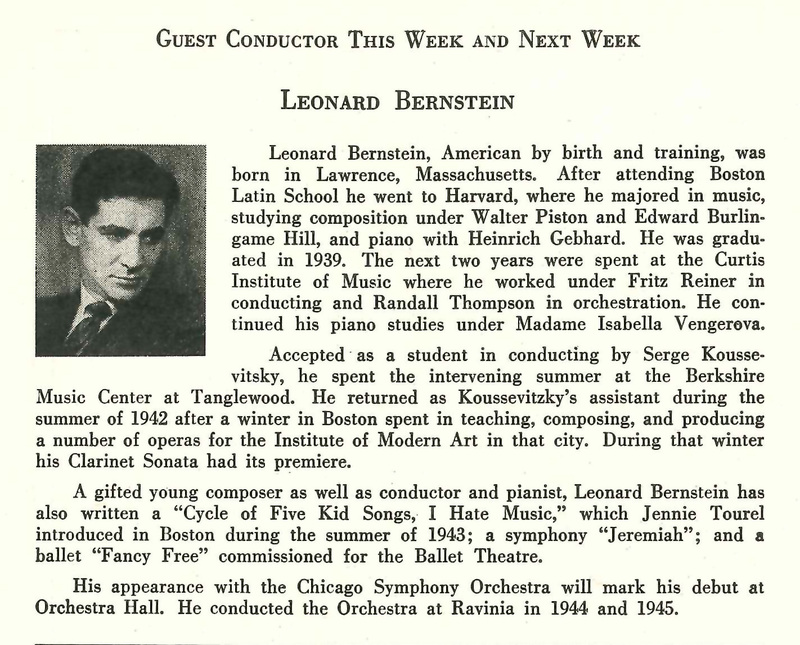 Images of the revised program pages can be found here, as part of the BSO’s Archives fantastic project to digitize their program book collection. A second footnote: to commemorate the anniversary, the Chicago Symphony Orchestra will perform Stravinsky’s Elegy for J.F.K. on November 21, 22, 23, and 24, 2013. Kelley O’Connor will be the mezzo-soprano soloist; the work also features CSO clarinetists John Bruce Yeh, Gregory Smith, and J. Lawrie Bloom. Michael Tilson Thomas conducts.